If you see a cute little woodpecker hanging upside down on a narrow tree branch or at a suet feeder, it's likely to be the Downy Woodpecker. At only 6-7 inches long, the Downy Woodpecker is the smallest woodpecker in the United States. Downy Woodpeckers tend to avoid desserts but are comfortable almost anywhere else with trees. The female Downy Woodpecker lays 3-6 eggs which she and her mate will take turns incubating. Downy Woodpeckers are as much at home in your neighborhood tree as they are in an orchard – as long as there are insects or suet to eat. Downy Woodpeckers are inquisitive and "cute" birds that stay in forests or other wooded areas year-round. Flowering and fruit-bearing trees are especially attractive to Down Woodpeckers, as they tend to attract insects the birds can eat. Sometimes mistaken for the slightly larger Hairy Woodpecker, the Downy Woodpecker can most easily be distinguished by its smaller size and shorter beak. There is a great visual comparison of the two here. Like all woodpeckers, the Downy Woodpecker is black and white. Males have an extra splash of red on the back of their crown, but otherwise the male and female birds look very similar. Most high school drummers couldn't keep up with the fast beat these tiny birds create. Down Woodpeckers make a lot of noise when the males are trying to attract the attention of nearby females. During mating season, a Downy Woodpecker will peck continuously at a tree - creating a loud "drumming" sound that indicates its territory and attracts a female. 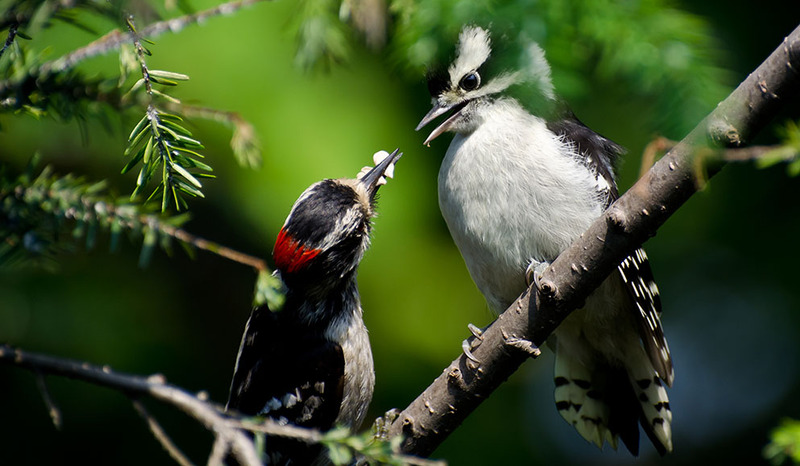 Downy Woodpeckers also have a high-pitched call that is very distinctive, once you know what you are listening for. Often described as acrobats, Downy Woodpeckers are most commonly found near open areas where they will comfortably hang upside down to eat insects off of hard-to-reach areas of a tree. Trees are also the preferred nesting spot of Downy Woodpeckers, although they will occasionally use man-made woodpecker houses. If you are trying to encourage a Downy Woodpecker to nest nearby, hang your bird house on a tree at least 5 feet off the ground (the higher the better). Once the nest is excavated in a tree trunk, or the pair makes a nest in a birdhouse, the female Downy Woodpecker lays 3-6 eggs. She and her mate will then take turns incubating the eggs until they hatch. After almost 2 weeks (usually around day 12), the eggs hatch into tiny nestlings. Less than a month later the babies will be strong enough to leave the nest, at which time the female may start a second brood (primarily in Southern states). Downy Woodpeckers have fascinating feeding patterns. Outside of mating season, it's common to find Downy Woodpeckers in a mixed flock of birds, including cardinals and chickadees. By staying in a group of birds, they all have a better chance of avoiding predators. You’ll notice that many times, when one bird flies off the others follow. That flock mentality is a result of the constant threat of a bird of prey or other predator attacking. 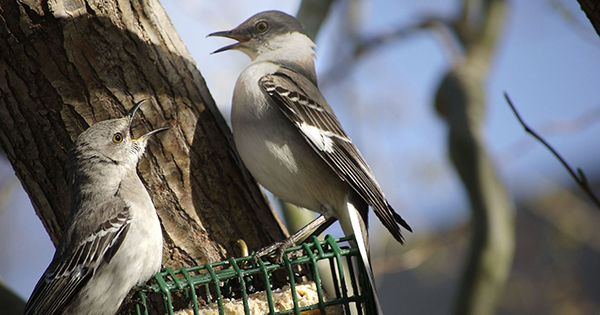 While Downy Woodpeckers are on alert for predators, they are not terribly afraid of people. 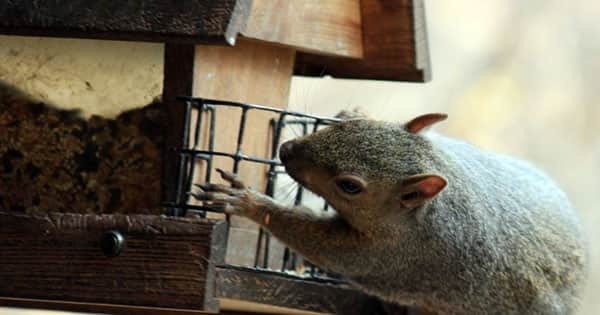 If they become comfortable with your presence near a bird feeder, they may allow you relatively close before flying off. They have been observed quite close to dogs in back yards as well, as long as the dogs show no interest in them. Downy Woodpeckers are very food motivated, and will stay close to feeders that a kept filled. They will also climb up and down the sides of trees for food, and hang upside down on small tree branches or tall weeds to get hard-to-reach insects. Accomplished fliers and confident clingers, these small woodpeckers will actively search out food at bird feeders too. 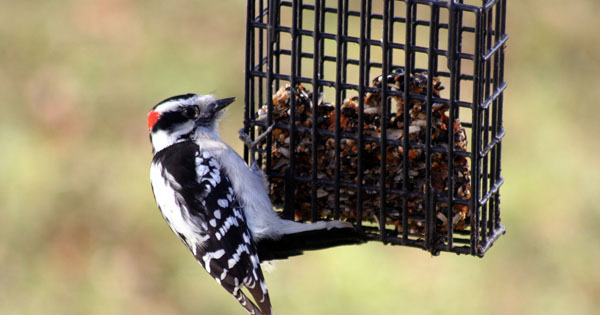 While they prefer suet, you may also find Downy Woodpeckers eating peanuts, peanut butter or sunflower seeds. 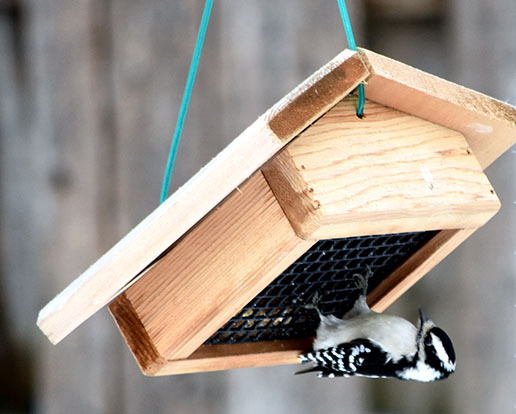 Since a wide variety of birds (and squirrels) like suet, peanuts and sunflower seeds, beginning birders anxious to observe the Downy Woodpecker may want to get an upside down suet feeder. These feeders cater to the unique characteristics and preferences of this tiny woodpecker, and very few birds will compete with Woodpeckers for suet that is mounted upside down. It’s just too hard for most birds to eat that way, but the Downy Woodpecker is right at home!